Charles This is not such a novel idea, maybe; but one of those things that is worth getting out in the open (reifying) at some juncture. where the numbers label the number of plays made internally to capture at particular points. Pass 3 Play at c.
That much reconstructs from the map. Attrition means that each pass puts Black in atari assuming all outside liberties filled. Black then captures. Altogether there are a dozen maps in all that are valid. I thought of this first in relation to the question of where the approach moves are. The answer seems to be: 2.5 at c and 1.1666... at each of a, b, c.
For a total of 6. 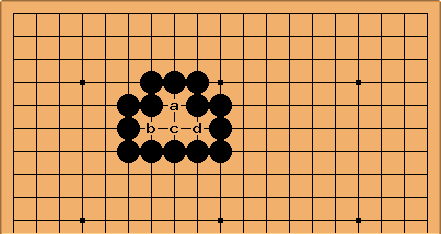 The proverb here (Four is Five and Five is Eight and Six is Twelve) counts 5 approach moves, because the assumption is that we begin with a white stone at c (or else Black at c lives, naturally).